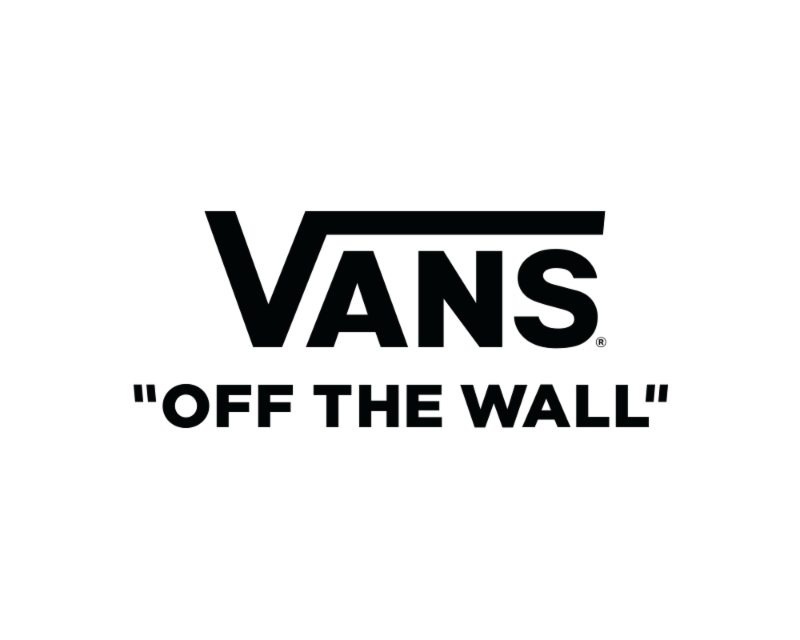 Each event featured pop up shops with exclusive merchandise and gear on-site. Local drummers, School of Rock students, bands and more performed both solo and with Frank at each event, while all those who attended were able to learn about everything from drums to business and more from both Frank and Mike. Whether these people were just starting out as drummers or have been playing for years, everyone was able to gain valuable insight into many facets of performance and the music industry. “These workshops took on a life of their own and we all leave this trip inspired, motivated, and ready to bring it to more cities! Watching the culture and connections between drummers, musicians, and parents was super powerful and we are proud to be a part of it!” shared Cipriari on the last few weeks of events. Be sure to stay tuned to https://www.sjcdrums.com/ for more information about future tours, events and to learn more about SJC Drums. Frank Zummo began drumming around age 3, when he discovered his father’s drum kit. By age 7, he was an award-winning drummer, taking home top prize in Long Island Drum Centers “Battle of the Beats”. Looking at Zummo’s impressive resume, it’s clear to see he never stopped. Zummo has performed on many TV shows over the years (The Tonight Show w/ Jay Leno, Conan O’Brien Show, Hells Kitchen, Master Chef, American Idol & Glee). He has also recorded on many platinum & gold records with artists including Kelly Clarkson, Orianthi, Gary Numan & The Used as well as on scores for the films “Seeking A Friend For The End Of The World” and “Beautiful Creatures.” Additionally, he has played for bands such as Julien-K, Dead By Sunrise (ft. Chester Bennington) and even filling in for injured Mötley Crüe drummer Tommy Lee during 2009’s Crüe Fest 2. The immensely talented drummer of punk-rock band Sum 41, EDM duo Krewella, and Street Drum Corps is part of the SJC Drum family. Frank and SJC partnered with Shepard Fairey, American contemporary street artist, graphic designer, activist, and founder of OBEY to create a custom drum kit. Finished by Shepard Fairey and titled “Rise Above,” the one-of-a-kind drum kit now resides at the Hard Rock Hotel in Las Vegas. 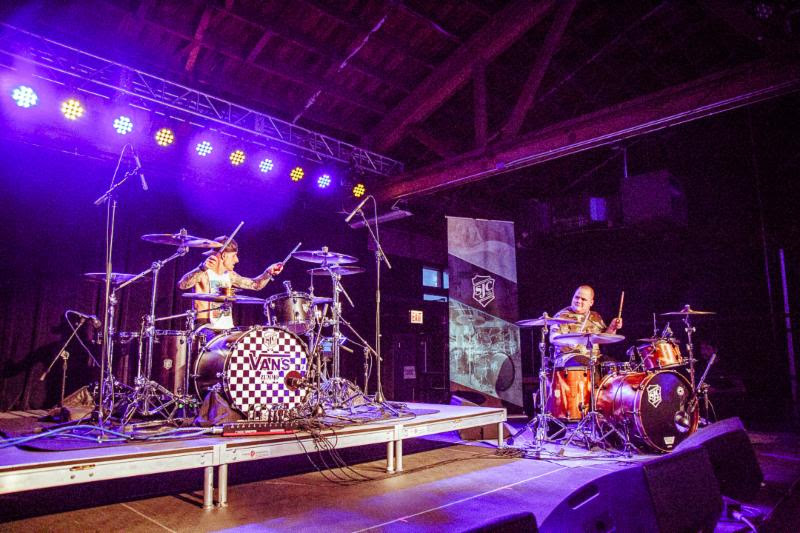 The drum kit was used by Frank Zummo from 2016-2017 during Sum 41’s U.S. and Canada tours, festivals and the 2017 Alternative Press Music Awards where Frank took home the award for Best Drummer and performed an epic battle with Josh Dun (Twenty One Pilots) and Adrian Young (DREAMCAR / No Doubt). The drum kit will remain at Hard Rock Hotel for the next three years with another portion of the kit taking up residence at the Rock N Roll Hall of Fame in Cleveland, OH. 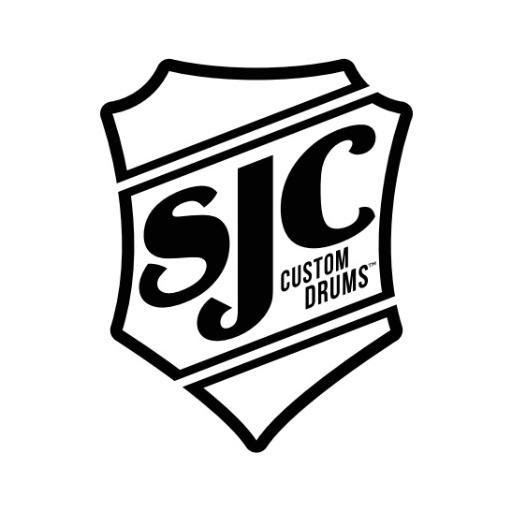 SJC Drums craft high-quality drums based on your unique needs. From the sound, look and feel that you require, they manufacture your dream into reality. SJC Drums is proud to have a collaborative culture and willingness to push the limits. They value every step of the process and strive to give you a seamless experience from the moment you contact us through your years of playing. 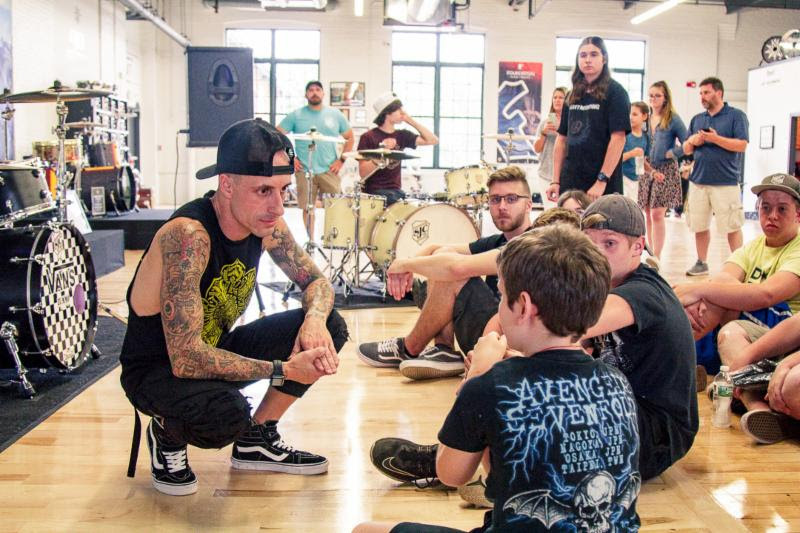 SJC recently presented a sold-out clinic tour featuring Frank Zummo overseas in China and look forward to creating unique opportunities for musicians to learn and grow in their craft.